OAKLAND, Calif. (AP) - After squandering a 16-point lead and blowing a chance to steal home-court advantage from Golden State, there were plenty of reasons for the Houston Rockets to be upset. Now they must hope that they didn’t lose more than just Game 1 of the Western Conference finals. They have a knee injury to star center Dwight Howard to worry about. Stephen Curry scored 34 points and outdueled James Harden down the stretch with Howard relegated to spectator status and the Warriors beat the Rockets 110-106 on Tuesday night. Howard hurt his left knee in a first-quarter collision with teammate Josh Smith. He tried to come back into the game in the second quarter but lacked his usual athleticism because of the injury and eventually left the game for good with a bruise less than a minute into the fourth. With Howard spending so much time on the bench, both teams used smaller lineups for much of the game and that played right into Golden State’s hands. 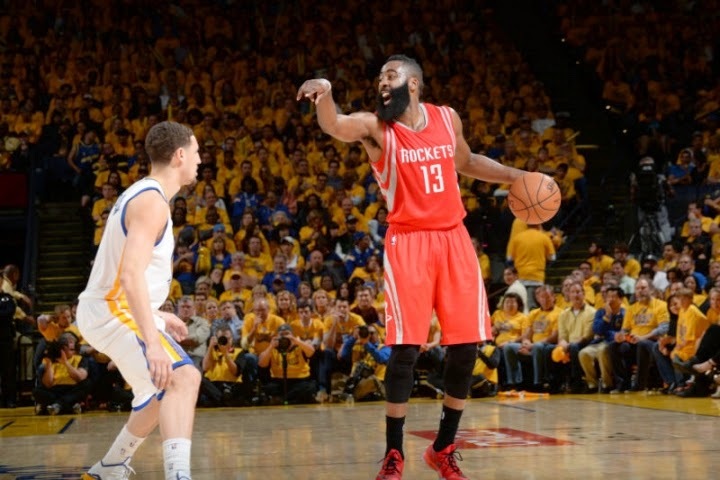 The Warriors went to it at first in the second quarter after Houston built a 16-point lead. Using the lineup with Draymond Green at center, Golden State closed the first half on a 21-4 run to take a three-point lead. The Warriors went back to it at times again in the second half and were able to hold off a late charge fueled by Harden’s 21-point second half to win the opener. The Rockets must wait to see whether Howard will recover in time to play Game 2 on Thursday night in Oakland. Harden, serenaded with chants of “Over-rated!” from Warriors fans, mixed in a series of step-back jumpers and driving layups to help Houston even the score at 95-all midway through the fourth. He finished with 28 points, 11 rebounds, nine assists and four steals. But the Warriors shut down Houston for long stretches, and Curry kept hitting shots. He connected on a 3-pointer and converted a layup to put Golden State up 108-97 with 2:01 remaining. The Rockets never relented, though, with Trevor Ariza making a 3-pointer that trimmed the Warriors’ lead to 108-106 with 14.6 seconds to play. Curry twice caught the inbounds pass, and the Rockets were forced to foul him both times. He hit both free throws to seal Golden State’s win.